Nike - Boys' Kawa Shower Slide Sandals from Finish Line Give his feet a break and some coverage in the shower with the stylish Nike Big Boys' Kawa Shower Slide Sandals. These soft slides conform to the foot allowing for natural movement. Kenneth Cole - Little & Big Boys Good Guy Flip-Flop Sandals Perfect for the beach or boardwalk these super-cool flip-flop sandals from Kenneth Cole offer warm-weather style and all-day comfort. Nike - Boys' Kawa Slide Sandals from Finish Line Give her feet a break with the stylish Nike Big Boys' Kawa Slide Sandals. These soft slides conform to the foot allowing for natural movement. Polo Ralph Lauren - Little Boys' Quilton Slide Sandals from Finish Lin Classic Polo style and a laid-back silhouette team up on the warm weather-ready Polo Ralph Lauren Little Boys' Quilton Slide Sandals. Robeez - First Kicks Sophie Sandals, Baby Girls & Toddler G She'll shine in these charming open-toe sandals by Robeez made from gleaming metallic leather. Puma - His favorite show is immortalized on the ultra-cool Puma Little Boys' Sesame Street Leadcat 50 Athletic Slide Sandals. 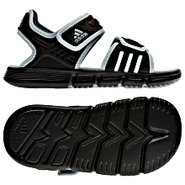 From sunny days to casual activities these slides keep him cool and comfy. 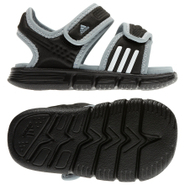 Stride Rite - Baby Boys & Toddler Boys M2P Phibian Water Shoes Dress your little guy for the playground the beach and beyond in these fantastic Stride Rite sneaker-sandals which pair colorful design with Made2Play machine-washable construction. CHAMPION - Boys' Ipo Jock Slide Sandals from Finish Line Breathe easy in the laid back Champion Big Boys' Ipo Jock Slide Sandals. Cool comfortable and boasting plenty of heritage good looks these slides deliver easygoing style for his busy day. Stride Rite - M2P Phibian Water Shoes, Baby Girls & Toddler Girl Quick-drying comfy style for your little lady these Stride Rite sneaker-sandals pair easy-to-care-for Made2Play machine-washable design with super-bright pops of color. Nike - Toddler Boys' Sunray Protect 2 Sandals from Finish Easy and breezy the Nike Toddler Boys' Sunray Protect 2 Stay-Put Closure Sandals feature a water-proof upper design and ultra-comfy fit for beach vibes no matter what he's up to. Nina - Little & Big Girls Hidi Shoes The perfect strappy sandal for her formal look the Hidi shoes from Nina feature metallic detailing and a fashionable heel. Steve Madden - Little Girls' Jadventure Sandals from Finish Line From the beach to the streets and everywhere in between the Steve Madden Little Girls' Jadventure Sandals are the perfect option for your little fashionista.
. - Little & Big Girls The Strappy Dress Shoes The Strappy sandals from Katy Perry combine an open-toe profile with an ankle strap and subtle heel for a chic formal look. Kenneth Cole - New York Corrine Finestra Sandals, Little Girls & Gentle wedge heels add a touch of height to these pretty Kenneth Cole New York sandals finished with lovely floral-inspired laser cutouts. Badgley Mischka - Little & Big Girls Pernia Velma Sandals An elegant finish to her formal ensemble these high-heeled sandals from Badgley Mischka feature a simple strap across the ankle and convenient zip closure at the back. Badgley Mischka - Ascot Gems Embellished Sandals, Little Girls (11-3 Put sparkle in her every step with this glam satin sandals complete with shimmering embellished accents and comfy memory-foam padding from Badgley Mischka. Badgley Mischka - Little & Big Girls Kendall Hannah Heeled Sandals An elegant finish to her formal ensemble these high-heeled sandals from Badgley Mischka feature a lovely embellished upper and criss-crossing ankle straps.